A resource for parents of easy ways to encourage the kids to eat their greens. 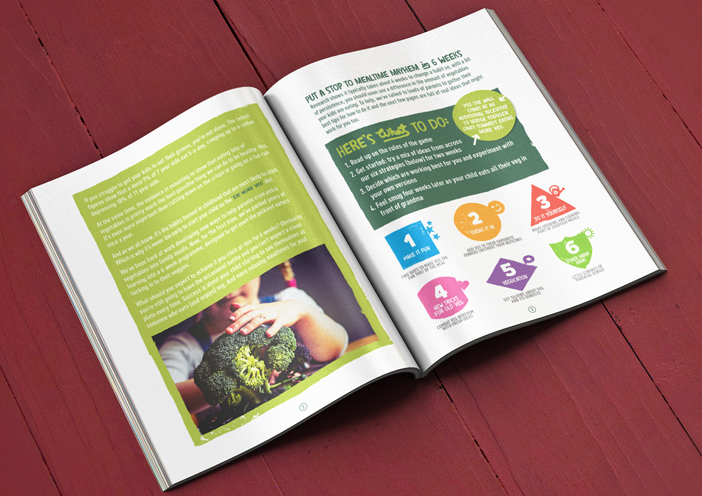 Funded by the Esmee Fairbairn Foundation, Eat Your Veg is a growing catalogue of real tips, advice and help from parents, with materials encouraging participation and sharing. During our work on Dabble with your dinner, encouraging veg consumption, many of our discussions with families came alive when we started to talk about the age old challenge of getting kids to eat their greens. In our research, parents told us that when it comes to family meals the children are in generally control of what gets bought and eaten. So not only do parents struggle to get their children to eat veg but simply having kids at home affects their own consumption as well. This led us to a clear focus on helping parents to encourage their children to eat more veg. This is rich territory to move into: all parents know the daily trials of getting the kids to eat their greens and they all have their own ideas and tactics to get them to do it. We’ve built on this existing engagement to generate a conversation, harvest tips from parents, and encourage sharing. We pulled together a catalogue of hundreds of tips: real ideas that have worked, from parents themselves. To keep it simple, these are categorised and use these ideas as content to inspire others – tactics like making it fun, getting kids involved in growing and cooking, or sneaking in veg. Resources include a popular website with interactive tips and downloadable activity sheets for kids, plus our 6 Week Programme – a booklet which guides parents through changing their kids eating habits in 6 weeks. Eat Your Veg ideas and resources have been distributed to thousands of parents, both directly through our own online and PR activities, and through partners including Tesco’s Eat Happy Project, Compass and the Women’s Institute. Additionally we partnered with the Soil Association on their Out to Lunch guide which helps parents choose healthy options for kids when they eat out.